Making Hollandaise Sauce is something a lot of cooks — good cooks — shy away from. Too many things can go wrong, or so they think. They might overheat the egg yolks, causing them to curdle. They might not be able to form a proper emulsion. Their Hollandaise Sauce might be too thick, or too thin. But if you pay attention to just a few details (easy ones), you should have no fear. And if you do run into problems, almost all are easy to remedy. Besides, Easter is coming up. For many people asparagus is an Easter tradition — and what’s asparagus without freshly made Hollandaise? So promise yourself that this year you’ll learn to make Hollandaise Sauce. And you’ll have the best Easter meal ever. The basics of Hollandaise Sauce are a snap: Whip egg yolks and lemon juice over heat until the mixture is light and foamy. Then beat in butter a bit at a time until you’ve formed a thick emulsion. Finally, season to taste, and serve. Beating egg yolks with liquid over heat is exactly what we did when we made Zabaglione. So if you made that delicious dessert, you’ve already mastered half the technique of making Hollandaise. The rest is easy — it just involves beating in butter bit by bit. Simple. 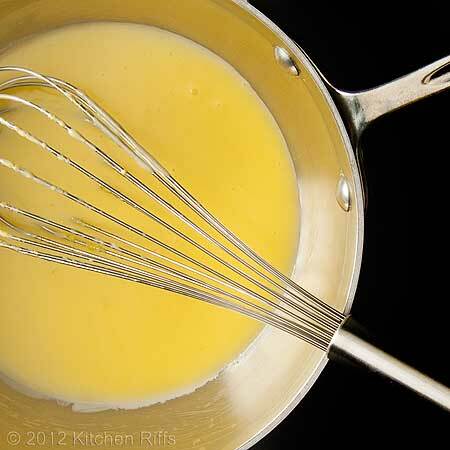 The trickiest part of making Hollandaise (or Zabaglione) is to make sure you don’t overheat the egg yolks. Do that and you have scrambled eggs. In the Zabaglione recipe, we beat the egg yolks in a bowl that was set over (but not touching) simmering water. You can also use a double boiler. But with care, it’s easy to make Hollandaise in a pan that’s set directly over medium-low heat. It’s even easier if you have a pan with sloping sides, like a Windsor pan or saucier pan (which is a more useful all around pan). If you’re careful, you can even use a metal mixing bowl: Just set it over the heat element or flame of your stove. But be aware that because the metal is thin, it’s going to heat quickly, speeding up the point where your egg yolks could begin to scramble. Most home recipes (including mine) call for three egg yolks. That’s enough to thicken about a pound of butter when making Hollandaise Sauce by hand. But the sauce is easier to make if you use less butter — and besides, who needs to eat that much butter? So we’ll use half a pound. And we’ll use even less when making the Hollandaise Sauce in a blender. If you use too much, the sauce gets too thick and may clog the blades of the blender (if this happens, you can correct it by adding another egg yolk). Over the years, I’ve come to like Julia Child’s approach to making Hollandaise Sauce, and my recipe is adapted from The Way to Cook and Mastering the Art of French Cooking, Volume 1. This recipes yields a cup to cup and ½ when making the sauce by hand, or about ¾ cup when making it in the blender. Total preparation time is about 10 minutes. You should use the Hollandaise Sauce right away, so make it at the last minute. I don’t recommend refrigerating leftovers. Place egg yolks into saucepan (Windsor or saucier pan preferred). From a stick of butter, cut four 1-tablespoon pats. Reserve. Cut remaining butter into pieces of about a tablespoon each (to promote quicker melting), place in a separate small sauce pan, and heat until hot and foaming but not brown. Keep warm. But not too warm – it should be about the same temperature as the egg yolks when you add it to them in Step 7. 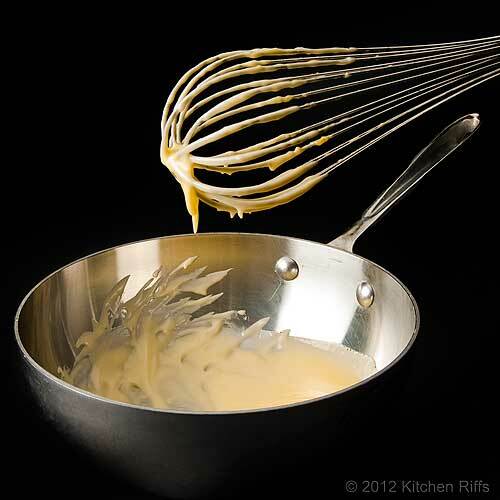 Using a whisk, whip egg yolks in the pan for a minute or so until they are thick and pale yellow (in one of her recipes, Julia Child says to whip “vigorously”). Add the lemon juice and whisk for about 30 seconds to incorporate. Put saucepan with the egg yolk mixture over low heat (or simmering water if using that method), add 2 of the reserved pats of butter, and whisk at a moderate pace. (The butter will melt as you whisk, helping to avoid curdling the eggs.) Beat until egg yolks have thickened, 1 to 2 minutes. When the egg yolks are ready, they’ll cling lightly to the whisk and you’ll be able to see the bottom of the pan between strokes of the whip. If at any time you think the egg yolks are getting too hot and are on the verge of scrambling, lift the pan from the heat and beat more quickly to cool the mixture. Remove egg yolk mixture from heat and add the other 2 pats of reserved butter, one at a time, whipping continuously (the butter helps cool the mixture). You’ll see an emulsion beginning to form (the sauce thickens). Begin to beat in the warm melted butter by adding drops (maybe a quarter of a teaspoon at a time). As the sauce continues to thicken (it will look like heavy cream) you can add the butter a bit more quickly. But don’t overdo it — if you add too much butter at one time, the sauce can break and you’ll lose your emulsion (see Notes for how to correct). If there’s a milky residue at the bottom of the butter pan, do not add that. Place egg yolks, liquid, and salt, pepper, and optional cayenne pepper to taste in blender jar. Cut butter into about 8 pieces (to promote quicker melting), place in small sauce pan, and heat until hot and foaming but not brown. Allow to cool for a minute or two before you begin the next step. Cover blender jar, and process at high speed for 2 seconds to whip egg yolk mixture. With the blender still running, remove top of blender (many have a small cap that allows you to pour liquid in without removing the whole top; remove cap if your blender has that feature), and slowly pour in hot butter. You want a very slow, thin stream of butter — droplets, really. Pour in all butter except milky residue that may be at bottom of pan. Eggs carry a slight (but real) risk of salmonella. So I suggest using pasteurized eggs. Although it’s unlikely that the eggs you buy will be infected, why take the risk? And although you’ll be cooking the egg yolks, it’s possible you won’t heat them sufficiently to eliminate all salmonella. Here’s the easiest and fastest way to separate eggs: First wash your hands thoroughly. Then crack the egg, open the shell into the palm of your hand, and let the egg white run through your slightly open fingers. I find that it’s fastest if I transfer the egg from one hand to the other once or twice during this process. When all the white has left your hand, put the egg yolk in separate bowl. If you have plans for the egg whites, I always put them in a separate bowl, too, so if the yolk breaks on the next egg I’m separating, it won’t get in my whites. What to do with the egg whites? Make dessert! A perfect dessert for Easter – or any special occasion – is Homemade Meringues. 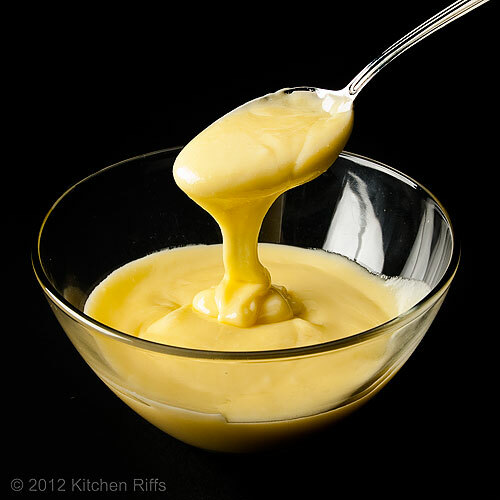 Many professional kitchens make Hollandaise Sauce with clarified butter (butter that has the fat solids and water removed). Why? Because you can make a thicker sauce with clarified butter (there’s no water in the butter to dilute the sauce). Of course, sometimes you don’t want a thick sauce. If your sauce is too thick, beat in some hot water. I tend to put just a bit of salt, pepper, and cayenne pepper in the egg mixture at first so I don't risk over seasoning. Then I adjust the seasoning right at the end. Same with lemon juice: If your sauce doesn’t have enough lemon flavor, add a bit more lemon juice at the end. You can substitute vinegar for the lemon juice in Hollandaise if you wish, but in my opinion the flavor isn’t as good. The most common mistake people make with Hollandaise is adding melted butter that is too hot, or adding too much too soon. When this happens, the emulsion breaks — it becomes thin and grainy. If your butter is too hot, just stop making the Hollandaise for a minute or two to allow the butter to cool. Resume when the butter is about the same temperature as the egg mixture. If your sauce breaks or doesn’t thicken in the first place, put a teaspoon or two of lemon juice in a bowl, and add a tablespoon of the sauce. Whip until the sauce forms an emulsion (it will thicken), then beat in the rest of the sauce a tablespoon at a time. Make sure each tablespoon of sauce has emulsified and thickened before adding the next. If your sauce breaks, you can also rescue it by adding a tablespoon of heavy cream, beating in a bit at a time. If your sauce is too thin, beat in more butter a pat at a time until it's the consistency you want. If too thick, beat in hot water a tablespoon at a time until it's the proper consistency. Making Hollandaise in the blender is practically foolproof — I’ve never had a failure doing it this way. But I rarely use this method anymore because it’s such a pain scraping the sauce out of the blender with a spatula. A tablespoon of chopped fresh tarragon or other herb is a flavorful addition to Hollandaise. Hollandaise Sauce is best if served immediately. If you need to wait to serve the Hollandaise sauce, it will hold if placed near (not on) a stovetop element turned very low; or in an extremely low-heat oven (150 degrees); or over a pan of warm (not hot) water. You can keep leftover Hollandaise for a day or two. You can even freeze it. However, in my opinion, the pizzaz just won’t be there when you reuse it. Better to make a fresh batch. The famous French chef Auguste Escoffier simplified and modernized traditional haute cuisine in the late 19th and early 20th centuries. Among his contributions was recognizing that most sauces in French cooking were based on and derived from 5 basic recipes — he called them Mother Sauces. Hollandaise is one of the five. The others are béchamel (a white sauce made with milk or cream), espagnole (veal stock), velouté (a white sauce made with poultry, meat, or fish stock), and tomato. Of all these sauces, Hollandaise may be the one that tastes best on its own. But of course you make the sauce because you want to put it on something! It’s the classic topping for Eggs Benedict. And Hollandaise has a marvelous affinity for fish (salmon in particular). Another classic pairing is with artichokes. Dip each leaf in the sauce, and then scrap the artichoke meat — and sauce — off with your teeth. Heaven. Or try Hollandaise on asparagus. I think it goes particularly well with the intense flavor that develops when you roast the asparagus. And because Roast Asparagus is a tradition at the Kitchen Riffs’ Easter table, it will be the subject of a post later this week. Wow, that sauce looks amazing! My favorite thing for breakfast are eggs benedict. Would never have thought of putting it on roasted asparagus. Will try it out. Hi Asmita, Hollandaise is so good, isn't it? Hollandaise + asparagus (roasted or otherwise) is an exquisite combo. Thanks for your comment. 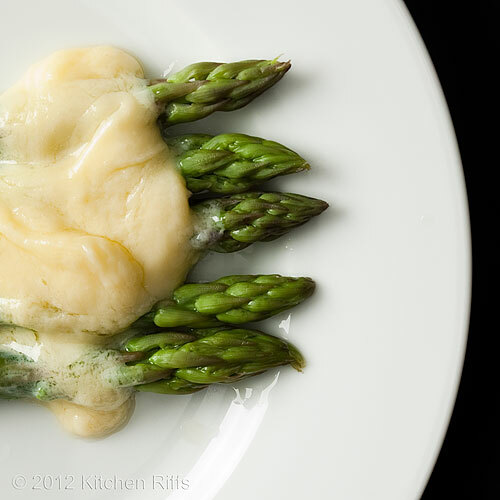 Some poached asparagus would be great with this creamy sauce. I have a stick blender, might just give it a try! Hi Angie, any kind of asparagus would be great - steamed, poached, you name it. I've not tried to use a stick blender, but it'd be an interesting experiment - I'll bet it would work. Let us know! Thanks for taking time to comment. I love homemade hollandaise sauce, and as usual your post is chock full of great information and advice! Thanks. I just made some the other day and while I've gotten quite good at it, I made the mistake of stepping away for a second (what was I thinking? I was in the midst of brunch madness) and my egg yolks cooked a bit so I had to start over. So it goes. I usually use a metal bowl set over a small pot of simmering water, I've never tried it directly in the pot! Hi KB, you're welcome! Enjoy - it's delicious stuff. And thanks for commenting. Hi Katherine, I know you like it - you did a terrific post on it not long ago! And thanks for making a valuable point: although Hollandaise Sauce is pretty simple, you do have to pay attention - be diligent - when making it. Thanks for stopping by. Your hollandaise sauce is picture perfect. As always you give so many great details that it makes it effortless for anyone to prepare. Nice post! Hi Vicki, thanks for your kind words and for taking time to comment. Hi Terra, I agree - Julia was the best. And although I think the flavor of the hand made Hollandaise Sauce is better, the blender made is quite good too - and you don't have to worry about overheating the egg yolks. Good for beginners - at least my first Hollandaise was made in the blender. Thanks for your comment. This looks so perfect! I loved the picture....Let me try this Hollandaise sauce recipe ASAP....can't wait any longer! Hi Purabi, I think you'll enjoy making this. And I know you'll enjoy eating it! Thanks for commenting. Hi C C Uru, Yum indeed! It's great! Thanks for stopping by. Hi Maureen, yes, freezing works. However, when you reheat it, it may (probably will) break - so you'll have to deal with that. And the sauce won't have as good of a texture (it will be less airy, perhaps a bit grainy). I always end up tossing the excess sauce (like you, I often make it just for 2 people). But I don't see any reason why you couldn't make a Hollandaise Sauce with just one egg yolk - and much less butter (maybe 3 ounces?). Or 2 egg yolks. You've given me an idea! I'll have to work on a recipe for Hollandaise for 2! But it will be awhile. Thanks for your comment. I like Hollandaise with Eggs Benedict. Hollandaise with asparagus is also a classic, thank you for sharing your recipe! Hi Mary, the blender is great and really foolproof, but I got tired of scrapping out the sauce, so I decided to learn how to make it by hand. Thanks for the kind words, and for taking time to comment. Hi Biana, both are great ways to enjoy Hollandaise, aren't they? At least I like them both. I think my absolute favorite might be with artichokes - but really, Hollandaise Sauce + anything = delighted stomach. Thanks for stopping by. Ahh, pure gold. I love Eggs Benedict--I've never had Hollondaise on asparagus however. It certainly sounds delicious! Hi Culinarily Courtney, pure gold is a great way to describe Hollandaise Sauce! And it really dresses up all sorts of veggies, asparagus in particular. Thanks for your comment. HOW HOW HOW. i know you say its easy, but i tried and UTTERLY failed at this last week. i used some online instructions that involved a double boiled, and my eggs kept getting too hot and scrambling. this weekend i'm trying your blender method. seems much easier!! thanks for all the helpful tips and hints. i can't wait to take another crack at it! As usual you are sooo good at technique and explanation. Thanks for all of it and that yummy picture of the asparagus. Another use for those egg whites is marshmallows. I usually do these about this time of year but haven't posted them yet. Now you gave me an idea. Hollandaise over marshmallows. Not! Hi Lannie, I almost think the double boiler method is harder in some ways. It takes longer to get the eyes to temperature, so it's easy to lose focus, and let them get too hot. Egg yolks begin to curdle at 180 - 185 degrees, so you want to keep them below that. But at the same time you need to get them hot enough, or the Hollandaise will be thin or might break. When you beating the egg yolks in Step 5, watch them. When they're ready - and shortly before they begin to scramble - they'll thicken and when you beat them with the whip you can see the bottom of the pan. They're ready! (OK, maybe they could stand another3 - 5 seconds of cooking, but that's it. Remove from heat and beat furiously to cool the egg yolks. I'm repeating some of the instructions in Step 5, but these are the key to getting your yolks heated properly but not too hot. Anyway, the blender method is much easier - the biggest danger is adding the hot butter too quickly and cooking the egg yolks. But if you dribble it in, you won't have that problem. Let us know how you do on your next batch! And thanks for your comment. Hi this is How I Cook, I've never made homemade marshmallows, but I've been seeing them on a lot of blogs lately. But they're a great topic, and I'd enjoy reading your take on your blog. Thanks for the kind words, and your comment. I am actually hosting an asparagus-themed linky party over at 2 Sisters 2 Cities as part of our Fresh Produce Tuesday series. I would love if you linked up this post! Hi Meaghan, thanks for your visit. I'll make sure to check out your Fresh Produce Tuesday series. Great recipe on hollandaise sauce! I am one of those home cooks who always shied away from making this at home. Partly because there are many reasonably priced brunch places in NYC that I can always get a serving of well made benedicts withing walking distance. But the real reason is that I've heard how delicate it is to make a good hollandaise sauce. Thanks for your detailed explanation on both the blender method and hand method. I am going to finally give this try soon. As always your pictures are great! Hi Yi, you do need to pay attention while you're heating the egg yolk, but it's not difficult (and the blender version is practically foolproof). It's a fun recipe to make, and once you learn how, you'll make it all the time. Thanks for the kind words, and for taking time to comment. Love the Julia version but if you read the commentary in Mastering she suggests a little corn starch beaten in at the beginning to hold the sauce longer. I do that and then keep the hollandaise in a warmed large mouth thermos that way I don't have to try to make the sauce in a crowded holiday kitchen after a couple of glasses of wine. Hi babsattmc, you bring up an interesting issue regarding holding the sauce. Hollandaise will hold for a couple of hours at about 145 degrees F. Restaurants do this all the time, using a bain marie or a steam table insert. And putting it in a thermos is another potential way to keep it at that temperature. But Hollandaise at the wrong temperature is also an excellent potential breeding ground for bacteria. And really, its flavor doesn't sparkle as much as it does when freshly made (it's still pretty darn good, though). So for these reasons I usually make it at the last minute - once you've learned how, even with a couple of glasses of wine, you shouldn't have problems (and if it breaks, you fix it; if the temperature of the sauce that you've premade drops, it will break and you'll end up fixing it anyway). But your point is excellent and good; if you experiment a little, you should be able to find a way to prepare your sauce ahead of time and keep it (safely, at the proper temperature), and then serve it at your convenience. Really informative comment - thanks for taking time to contribute. Hi Carole, thanks for alerting me! I'll certainly stop by tomorrow. I'm not familiar with the Mr Linky widget - and my history with getting this things to work is sketchy - but I will stop by. Thanks for stopping by here! OK! I don't know where all the hoopla about making Hollandaise sauce comes from nor do I understand why people keep trying to change the ingredients list or the methodology of making the sauce. Here is the bottom line on how to do it. Either with a double boiler or a pan placed directly on the heat source, heat the bottom of the pan to a temperature no hotter than what you can put your hand on comfortably. This should be the temperature of the pan for the entire process. Start whisking the egg yolks until they look like they are turning a light lemon color and are starting to thicken. Add the lemon juice at this point and keep whisking. Begin adding butter a piece at a time and whipping until completely incorporated. Also, keep checking that your pan is still very warm to the touch. Continue on until all the butter is used up. When finished with the butter the Hollandaise should be almost like mayonaise. Add the Red and White pepper, Chervil, Terragon, and salt to taste.and whip vigorously to blend everything in. Your done! Also have a couple ice cubes close at hand in case your eggs should curdle. All you have to do is throw one or two cubes and whip hard until they melt. Most often, you will have saved the day with this very easy means at your disposal. Hi Robert, thanks for your thoughts! Although your list of ingredients and method is essentially the same as mine. ;-) Once you've made Hollandaise Sauce it's easy, of course. But there are things that go wrong, so it's good be be aware of what they are — and what to do if something unexpected happens — before you make it the first time. Thanks for your comment. when would you add the chopped fresh herb? before or after the hot butter? Hi Anonymous, really good question. I'd do it after the hot butter. Fresh herbs tend to lose their aroma really quickly, so add them right before serving. Thanks for the comment. So in the blender method, you don't cook the egg yolks? Hi Anonymous, you actually do -- the hot butter in the blender heats the egg yolks. Although we suggest using pasteurized eggs because using either method, you may not heat the egg yolks enough to consider them thoroughly "cooked." Thanks for the questions. Hi Anonymous, I haven't tried OJ, and doubt if it has enough acid to really work in this sauce. I'd try vinegar if you don't have lemon juice. Won't taste quite as good IMO, but I'm guessing it'd work better than OJ. Let me know which you decide to use, and how it turns out!